Water: During the summer, allow the soil to dry out between waterings and then water so that the soil is soaked through, but not dripping wet. Don't let the roots sit in soggy or waterlogged soil. In winter, most succulents will only need water every month or so. They are basically dormant. If your house is particularly dry, you may need to water more often. The leaves will pucker slightly and begin to look desiccated if they need water. But just as in the summer, don't leave the plants sitting is soggy soil. Soil: In pots, use a chunky, fast draining soil. This is one group of plants that does not thrive in the traditional loamy garden mix. There are special potting mixes sold for succulents. In the ground, most succulents like a slightly acidic soil pH (5.5 – 6.5). Add some organic matter to very sandy soils, to retain moisture long enough for the plants to take it up. In clay soils, raised beds are your best option. 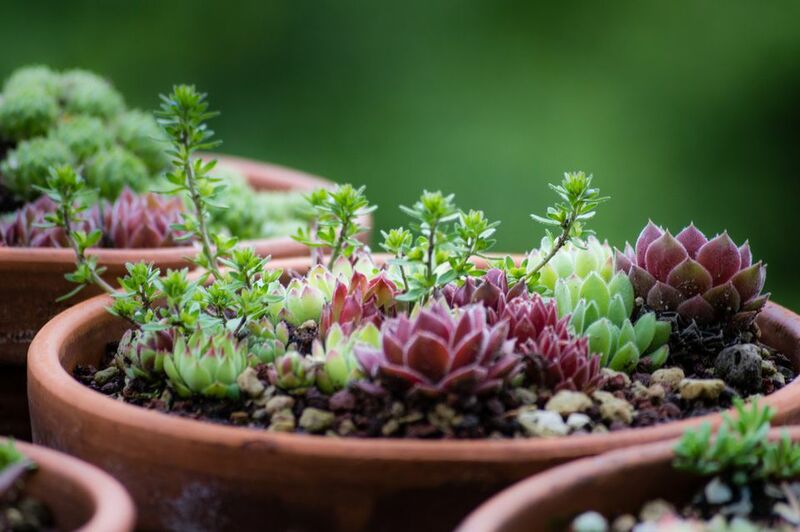 Below are some popular succulents that are generally easy to grow. The majority of us can't grow Aeoniums year round, in the garden. Don't let that stop you from enjoying them, though. 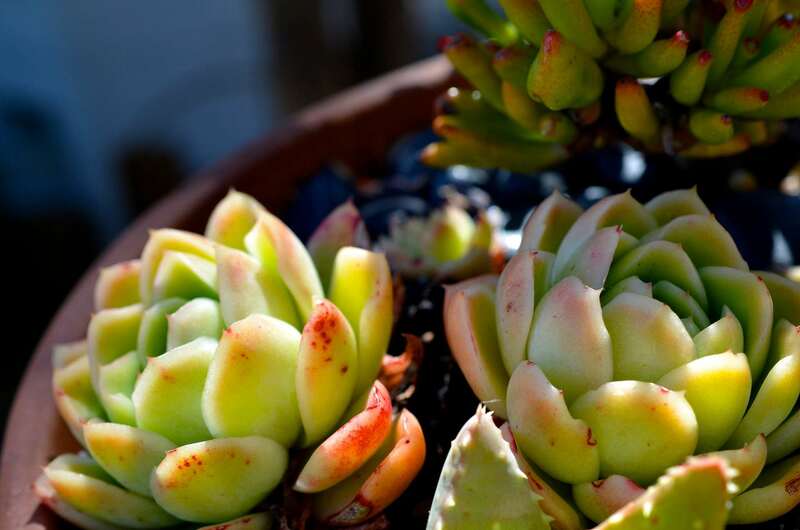 Although they have the familiar rosettes of Hens and Chicks, these quirky succulents are so waxy and shiny, they almost look artificial. In warm climates, they can grow into shrubs. Just imagine coming across a Hens and Chicks at eye level. You may be familiar with the giant Agave Americana, with its dangerous, serrated leaves. It's impressive, but not suited to most gardens. There are better choices among the dozens of Agave species. There are even some that can tolerate freezing temperatures. With about 350 species in this genus, there's a lot of variety. Jade plants, Crassula ovata, (syn. C. argentea and C. portulaca) are probably the most familiar, but there are also the stacked types, Crassula perforata, that look a little like paper chaines. Colors range from deep green to creams and yellows, silvery gray and shade of red. In frost free climates, jade plants will form small shrubs. There's are now some very pretty variegated varieties available, which need full sun to retain their colors. The staked varieties lend themselves to use in hanging containers and over walls. You'll love this little Crassula alpestris. The triangular leaves form stacked pinwheels. They are a pinkish-red during the winter, into spring. At the end of summer, you may get spikes of small white. They can handle some shade and like their soil on the dry side. Another succulent that forms flower-like rosettes atop long stalks. Echeveria resembles Hens and Chicks and can be very ornamental. The leaves are more delicate than they appear and can be easily injured in garden beds. They are perfect for containers and hypertufa. This is a large genus with a great deal of variety. Not all Euphorbia are succulents but they do all have a milky sap that can be irritating. Be careful about rubbing your eyes after collecting seeds. So many of us only know these Kalanchoe as houseplants, forced into bloom at the florists. There are several hybrids with different forms, but all have flowers in clear, bright colors. Kalanchoe blossfeldiana is one of the most readily available. It can do quite well indoors but has the annoying habit of growing long and gangly and not wanting to flower again. When that happens, ​take a few cuttings and start over. It is frost tender. There are about 100 species of Lampranthus, succulents plants from South Africa. They have bright colored daisy-like flowers. The best known is the Ice Plant, Lampranthus multiradiatus. These look best massed and where they are hardy, they make a great ground cover or turf alternative, although I wouldn't walk on them. They are very forgiving. If you forget to water them, they just kept on blooming. The tall Sedums, like ‛Autumn Joy' are wonderful showy, drought tolerant plants. Most bloom in late summer but look great for weeks as their broccoli-like flowers fill out. Even after blooming, the flowers just deepen in color and continue putting on a show. The creeping and trailing varieties have long been used in rock gardens and as ground covers. And they will cover ground very quickly. They have star-shaped blooms during the summer and are less attractive to deer than the tall varieties. You may see rabbits munching on them, though, probably for the water. Many varieties are extremely cold hardy. Hen and chicks have made a huge comeback. I remember them in my grandmother's garden and thought they were interesting, but not real flowers. I have become a total convert and enjoy spotting them tucked in throughout other's gardens. Sempervivums are cold hardy, but a little touchy about long, hot, dry summers. They are perfect for all kinds of containers, from hypertufa troughs to strawberry jars. These look a lot like Echeverias, but Sempervivum have pointed leaves that are a little thinner than Echeveria and they are more spherical. This is an odd group of plants, with bizarre shapes. The Candle Plants, Senecio articulatus, looks more like fingers, to me. Senecio talinoides var.mandraliscae, Blue Fingers, is icy blue-gray and these fingers are pointed. Then there's the perfectly charming Golden Groundsel, Senecio aureus, a ground cover with bright yellow, daisy-like flowers atop base rosettes. It's also hardy down to USDA Zone 4. Senecio rowleyanus (String of Beads or String of Pearls) looks more like a string of peas, but whatever it's called, it's striking.